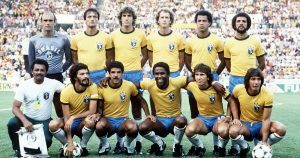 From the start of the tournament in Spain, it was apparent that Brazil’s array of flamboyant talents – Junior, Socrates, Falcao, Eder, Zico – was prepared to simply out-score the opposition. Having defeated the Soviet Union with two spectacular goals, they swept aside Scotland and New Zealand before dismantling their arch-rivals Argentina in the second group stage (infuriating a young Diego Maradona into getting himself sent off). Despite fielding the lumbering Serginho at centre-forward, they had scored thirteen goals in the process of winning those four games – comparing more than favourably to Spain’s champions of 2010 (eight goals in seven matches), or the long-awaited Brazilian triumph in 1994 (eleven in seven). Their Achilles heel was the lack of defensive organisation and the shortcomings of goalkeeper Waldir Peres behind them.